Faulty installations led to windshield ejections that ended the life of a 25 year old woman and paralyzed a mother in California. These tragic cases emphasized that the windshield is an integral safety component of your vehicle. It holds the roof up in the case of accident that involves a roll over. The passenger side air bags deploy off the windshield before coming back to protect your passenger. If the shield does not hold the air bag goes outside instead of coming back to work the way it should. Winter in the State of Maine has unique conditions that make the installation of auto glass more difficult here than most places. Because it is not common knowledge, many replacement companies "get away" with putting their profits ahead of your safety. You buy a safe car, put you, your children, and passengers in seat belts and you drive carefully. Don't let an unsafe windshield installation undermine your precautions. 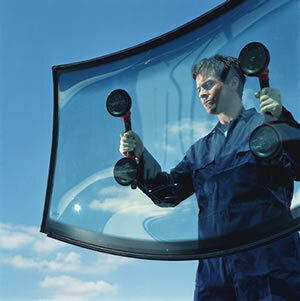 These are some things you should know about auto glass installation. MOBILE AUTO GLASS INSTALLATIONS ARE NOT A GOOD IDEA FOR THE CUSTOMER OR THE INSTALLER Mobile installations are when the company comes to your driveway or parking lot to do your shield for "your convenience." It may be convenient but it may not be a safe installation for you or the installer involved. MANY COMPANIES WHO "COME TO YOU" DO WHAT IS CALLED A "CLOSE CUT TECHNIQUE" This is when they leave a bed of the old urethane (the sealant) and work on top of it. This technique does not meet Original Equipment specifications. Carlite and many other manufacturers of auto glass are very clear about this. When doing a close cut you are mixing chemicals, which may not be compatible. Several things can go wrong with the fit during a close cut installation. You can end up with breaks and leaks, There could be rust under the old urethane that the installer will not see and take care of. Companies (or individual installers) choose to do this because it is quicker, and less complicated than a proper installation. IF IT IS BELOW 40 DEGREES YOU HAVE ANOTHER WHOLE SET OF PROBLEMS First of all you must use a two-part urethane that does not need controlled temperature and humidity to cure. This urethane is more costly. You need proof that you are getting this. Without this two part urethane your shield will not cure until it spends enough curing time (up to 24 hours) in the correct temperature. If you car stays outside or in an unheated garage it could be weeks or months. Many of the supplies that have to be used in an installation have a shelf life of seven days. If the urethane has not cured what happens to the other critical supplies that have now lost their shelf life? The pinch weld (the surface where the shield sits) must have no moisture in order for the urethane to cure properly. If it is raining or foggy the installer must have a way of getting the pinch weld absolutely dry and heated to 40 degrees. The urethane itself must be kept at least 70 degrees and not above 120 degrees. To assist with cold weather curing it is wise to mist the glass after installation and then turn on the defroster until it dries. All of these things are difficult if not impossible to pull off if being done in a parking lot. IT TAKES A LOT OF TRAINING TO HAVE A GOOD INSTALLER If an installation is being done in a glass shop there is usually some supervision and support. Many installers who know what they were suppose to do, choose not to. If an installer is out in the cold, unsupervised he/she may be more likely to take short cuts or ignore proper installation to get back where it is warm. There are a lot of good installers but you would have to know if you have one. One way of knowing is to check certifications. The certifications are often hanging on the wall when you go to a shop. NIOSH (the Federal equivalent of OSHA) says only 3% of the population are capable of safely setting a shield alone. The safety they are referring to is the installer's safety. Shields are bigger than ever and it has to be placed perfectly in order to get a good installation. The installer has to be tall enough, have arms long enough, and have enough upper body strength to do this. 3% of the population has the height and strength to properly install a windshield. So now you have someone out in the cold trying to deal with impossible weather conditions while they are in reality not even physically able to really do the job properly without putting themselves at risk. YOU HAVE THE RIGHT TO CHOOSE WHERE YOUR AUTO GLASS IS REPLACED The State of Maine has a "right to choose" law. Your insurance company does not have the right to tell or intimidate you into going to a replacement company because they have a low price. We have some knowledgeable, local agents who will probably put your best interest first however, you are often connected to a national call center when you call in your claim. You talk with someone who does not know your local shops other than the price they charge. Don't let the insurance companies or the national networks put their profits ahead of your safety. One of the last warnings in the 20/20 segment was "that insurance companies may not be the best place for answers because they may steer customers to the cheapest shop". Installation centers deal with this problem every day. The majority of insurance companies refuse to pay us what our trained installers cost us. They do not pay enough to cover the cost of a two-part urethane, which should be used for your safety and drive-away-time convenience. We try to make up for these shortages in the price of the glass itself but it is an ongoing battle. We fight as we negotiate with individual companies; we fight it in small claims court and with the insurance commission. We fight for your safety and our profits. O&P GLASS pledges to put your safety first. We will train our installers and provide them with the very best products available. We will do everything we can to keep our installers safe and pay them a fair wage. Think of O&P when you want the best job possible. O&P follows installation practices of The Automotive Glass Replacement Safety Standards (AGRSS™) Council Inc, (AGRSS™) is a not-for-profit organization dedicated to the safe replacement of auto glass.